Guzman Eye Care is a complete eye care facility specializing in comprehensive eye exams, ocular emergencies, cataract/laser surgery evaluations, contact lenses and dress and safety eyewear. Click on the links below to learn about everything from contacts to cataracts, computer vision to nutrition. 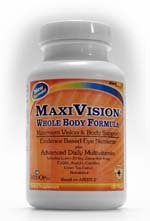 MaxiVision - The MAXIVISION product line offers a full selection of eye care, multinutrient supplements for maintaining ocular health. Whether you're looking for reading glasses, safety glasses or sunglasses getting the right prescription at Guzman Eye Care is as easy as 1, 2, 3. 2. Download all four forms, fill them out, and bring them for your office visit. The above forms are in Adobe PDF format. If you don't have Adobe Acrobat Reader, download it for free at www.adobe.com/products/reader/. 3. Choose your frames. We have a wide selection of frames available at our office! Choose from our featured frames from companies such as Maui Jim and Nike! We also have an excellent selection of frames in our office from Oakley, Ray Ban, Smith Optics, Gucci, Guess, Tommy Hilfiger, Boss Orange, Harley Davidson, Converse, AutoFlex, Candies, Sketchers, Bebe, Kate Spade and Juicy Couture.